The Roman Bath House, Ravenglass. 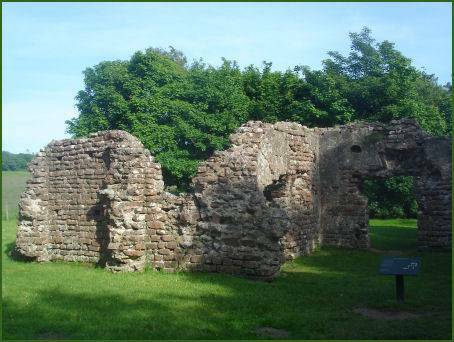 All that remains of the three hundred year Roman occupation of the town of Ravenglass is the impressive and well preserved bath house at Wall's Plantation, which is otherwise known as Walls Castle. The remains are located around a quarter of a mile east of the town, off a minor road leading to A595. 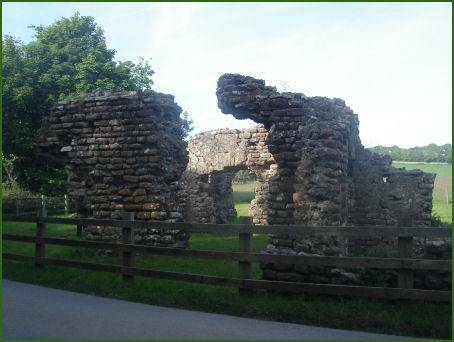 The bathhouse, which was established in AD 130, presents the highest surviving Roman remains in the north of England. The building measures 40 by 90 feet, with walls still standing at over twelve feet high, which follow a zig-zag angular design suggesting the complicated structure of the original building. Both round-topped arches are still visible and There are even signs of the internal mortar covering of the walls here and there. Lead seals discovered near the site indicate that the First Cohort of the Aelian Fleet were based here, a part of the Classis Britannica, or the Roman Naval British fleet. Much of the bathhouse complex, including the hypocaust flooring, which was discovered during excavations in 1881, is buried under a field to the east. Little remains but the earthworks of the Roman fort of Glannoventa which are located near the bath house. The fort was built to guard what was probably an important naval base, command centre and supply distribution point for the occupation of the northwest of England and there is evidence to suggest that the soldiers stationed there served in Hadrian's fleet. It was occupied by the Romans for around 300 years and probably represents the southern extremity of the 'Western Sea Defences', a line of forts and watch-towers erected along the north-western Cumbrian coast. The Roman name of Glannoventa derives from Celtic origins and was formed from the words glan/glenn 'bank, shore or landing' and venta 'market, trading-station'. The east rampart of the fort still survives up to a height of 1.5 metres. The fort was defended on its eastern side by a double ditch. It was garrisoned by the Cohort I Morinorum, a 500 strong unit. A railway line now runs through the fort in a cutting dividing it into two distinct areas. The bathhouse is now in the care of English Heritage. Open all week, admission is free. *Starting at the public car park at the back of the Ratty Arms by Ravenglass Station, follow the marked public footpath at the back of the car park, crossing the railway line via a footbridge. *Continue along the footpath until it joins a minor road, at which point turn right and follow the road. *Pass a caravan site on the left and continue along the road or take the path through the woods that runs adjacent to it to eventually reach the Roman Bath House. Retrace your steps to return.